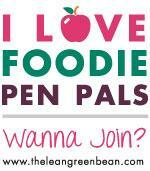 This was my first month with foodie pen pals. I really enjoyed the experience. One of the things that I found very interesting about this project it is really fosters respect for different dietary habits. Everyone participating has different food quidelines they live by. My pen pal this month is from Herman, Nebraska. Her name is Janell Carson. I was so excited to receive her box. Janell’s letter to me said she is a meat and potatoes kind of person but she was so respectful of my vegan diet and sent me some great treats. Her first item is Dorothy Lynch dressing made in Columbus, Nebraska. I honestly have never tried this before and I am looking forward to it. I am trying to decide what I want to do with it. I may marinate some tofu in it or drizzle it on some pasta. I am excited to try it. The second item was Aronia fruit chews. In her letter she talked about Aronia berries being the new superfuit. I try to keep up to date on the new super foods. I really enjoy trying out new things, especially things that are so healthy for us. I had never heard about aronia berries before and she letter made me dive into some research. I am so glad that she sent me these and told me about the berries. They will be a part of my regular diet now. My husband actually snatched this bag out of my hand as soon as he saw it. He told me they were delicious. Haha! This picture is not the actual bag she sent me but instead a picture from the internet, as I have yet to get the bag back from my husband. He said, “Thank Janell for me. I love them”. So thank you Janell. The third item or items, and my very favorite, home dried herbs from her garden. When Janell sent me her first email asking about my dietary habits and what foods I enjoy I did not even think to say spices. She must have been reading my mind because I LOVE spices of all kinds, especially home grown and dried spices. There absolutely isn’t anything better. I was like a kid in a candy shop when I saw these spices. There was actually more in each bag. I have already used some of them! Janell also sent me a couple recipes. She sent me a recipe for a copycat version of the Dorothy Lynch Dressing. I loved this. I love home making most of my foods so I was excited to see this recipe. She also sent me recipes for Tomato-Basil Soup and Mint Julep. I am in love with tomato soup, especially in the winter. It is my go to comfort food. So this recipe made me smile. As did the recipe for Mint Julep, we all need that perfect end of a hectic day drink and this will serve that purpose well. Great pictures & narrative, Sara. I’m glad you liked my stuff. This Foodie Pen Pal thing has been great fun!